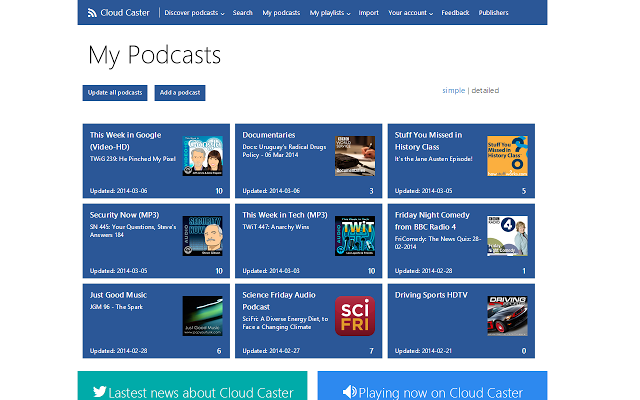 Check out Cloud Caster - your podcast-player in the cloud at http://www.cloud-caster.com. Cloud Caster can be used on your Chromebook, PC and Mac as well as on almost all mobile devices running iOS, Android, Windows Phone or Blackberry. This means you will always have access to your podcasts and have a playlist in sync. We will remember where you left off on one device and let you resume from that position if you continue to listen on another device. You can start listening to a podcast at home on your desktop computer, keep listening on the bus with your mobile device and finish the podcast on your computer at work/school when you get there. - We remember what episodes you have listened to and the progress in each episode in the cloud so you can always resume where you left off. - Cloud Caster supports both audio and video podcasts. - See what other users are currenty listening to and be inspired. - Find popular podcasts on our toplist. - Comment podcasts and read comments from others.